Wow! Privacy and views for miles! 3 bed/2 bath + 2 car detached garage. Good roads/access to town lead to this quintessential mid century Joshua tree property sitting on a fully fenced 2.09 acres; featuring New Grey Quartz Kitchen Counters with brand new Black Quartz Composite Sink, brand new Spring Loaded Matte Black Restaurant Style Kitchen Faucet, brand new Stainless Steel Kitchen Appliances, brand new Brushed Nickel & Galvanized Steel Lighting, brand New Roofing, brand New White Wash Interior Paint, brand new Grey Laminate Flooring, brand new grey on grey exterior paint, clear pest report, certified septic & much more! This home would make the perfect weekend retreat, vacation rental, or full time residence. 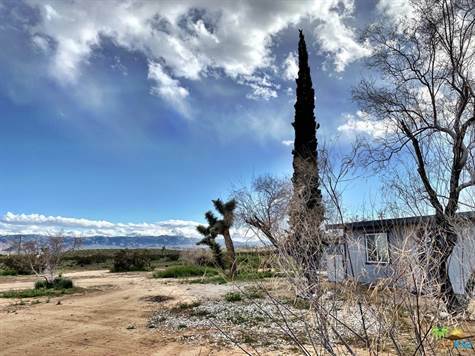 Don't wait for this modern and beautiful Joshua Tree acreage property!